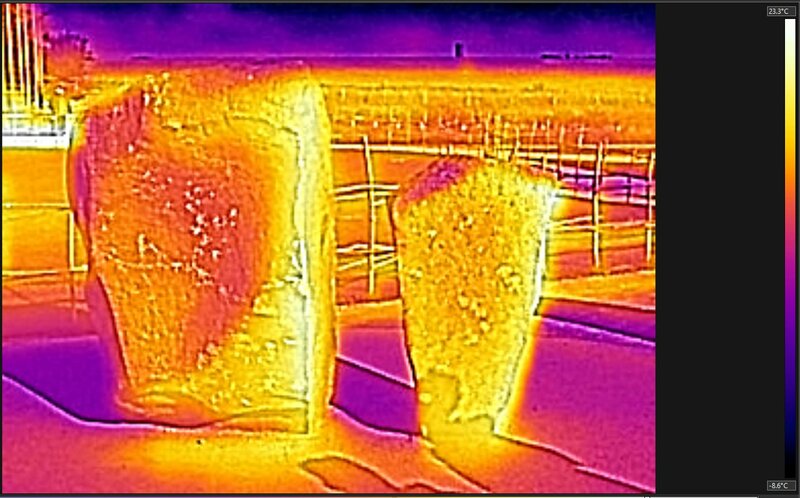 Inspired by Steve Marshall's work on the springs at Silbury Hill and the Avebury region http://www.stevemarshall.org.uk/docs/Silbury Springs v2.pdf I took my FLIR C2 thermal imaging camera there this morning. 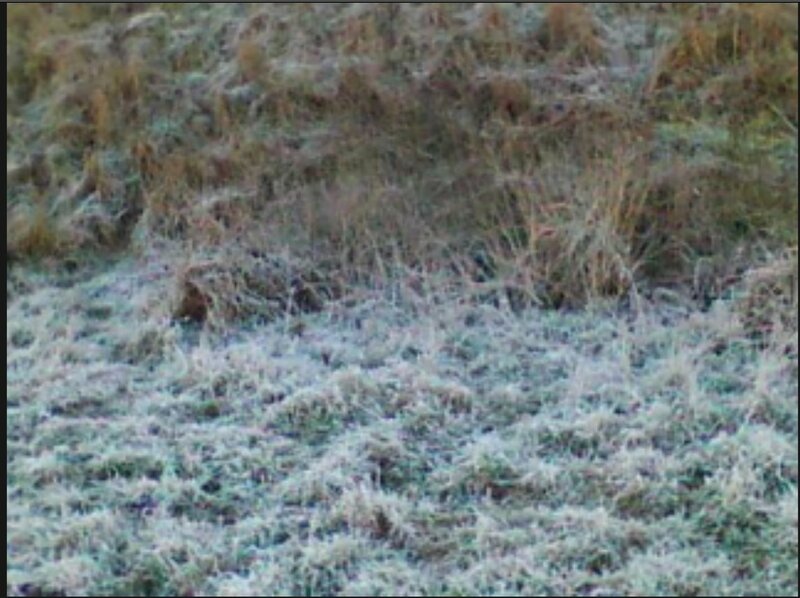 The springs are "warm" in that they stay above freezing even on a day such as today where it was -4C at dawn. 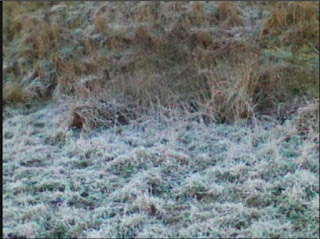 The water table is not very high yet but the patches of fresh water were unfrozen whereas water that had been standing all night was frozen. The temperature scale is to the right, the lighter the colour the warmer it is. Click to enlarge. Of more interest was investigating if this technique could find individual springs. 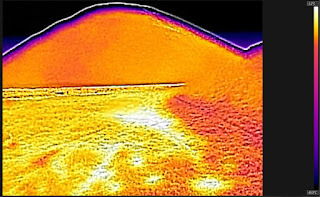 Below are the thermal and normal picture of part of the bank under the A4. 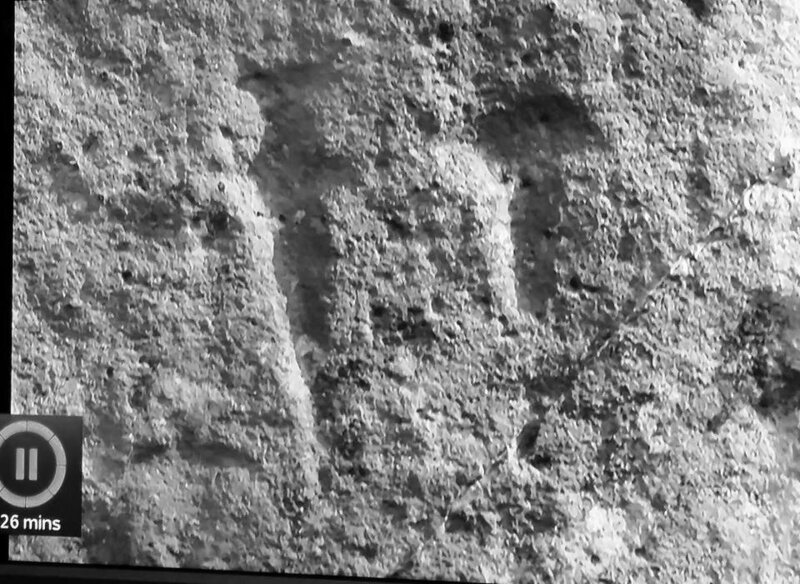 It shows a spring glowing white, on checking water was issuing from the ground there. 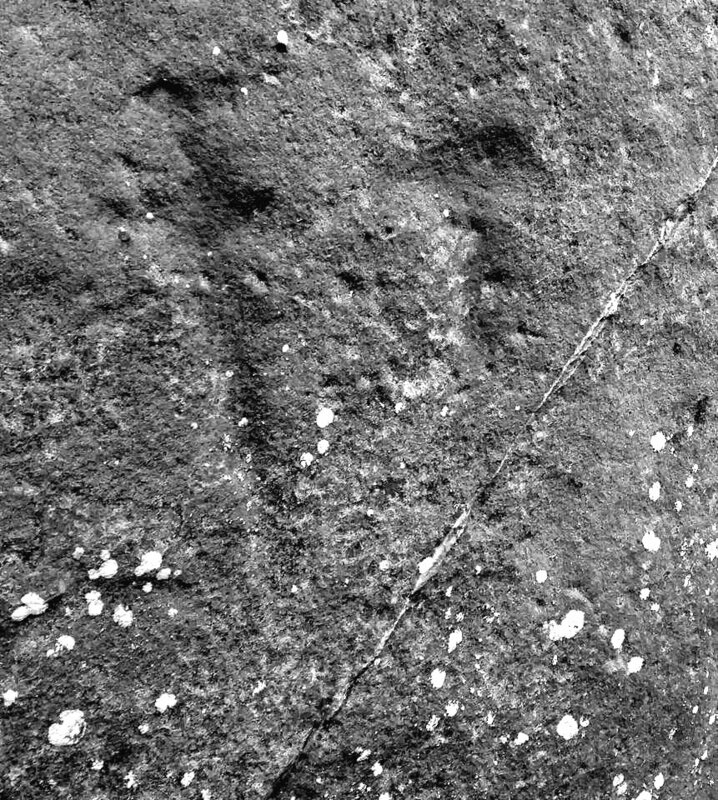 Without the camera I would not have noticed this spring which shows that this technique has promise and would be worth investigating further. It does need to be done before the sun has warmed the ground and probably it needs to be a cold day as well. I couldn't find any springs at the base of Silbury Hill itself by camera or inspection, probably the water table isn't high enough for them. 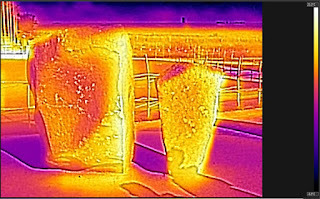 Excellent website from the University of Southampton "aimed at the general public and archaeology students. The approach chosen, the language used and the aspects stressed are intended as an exercise in communication with the non-initiated, not with the specialist. " 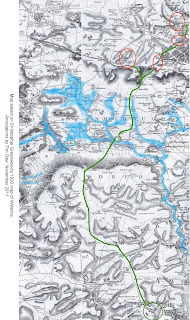 How wide was the Solstice gap in the Great Trilithon? Playing around with various reconstructions I think about 18 inches or 50cm, or maybe a bit less. 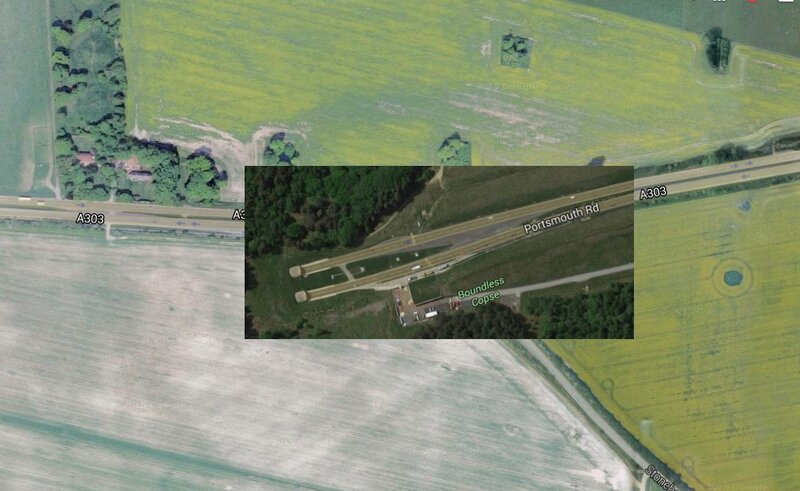 It would have looked like quite a narrow slot to observe the sun through. 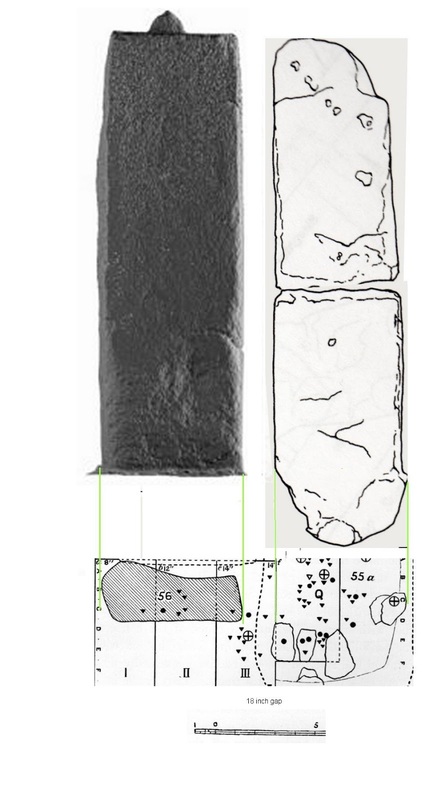 The picture is a scaled composite of the Laser Scan of Stone 56, My reconstruction of 55 taken from Cleal et al and the two parts rejoined together and the excavation diagram of Gowland showing the packing stones of 55 and the position of 56. © 2015 The Geologists' Association. 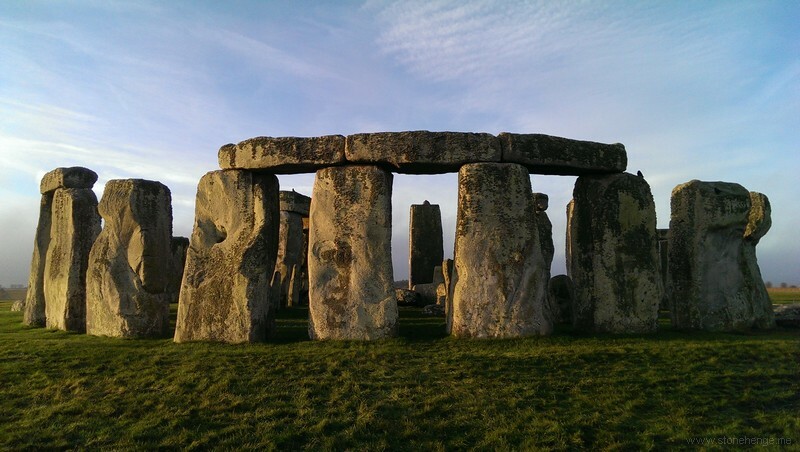 Around 4500 years ago, some 80 large blocks of silcrete or 'sarsen' were erected at Stonehenge during its second stage of construction. 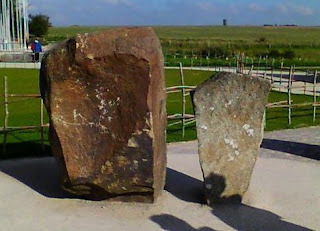 Stonehenge is the only prehistoric stone circle to have its stones dressed, and debris from this stone-dressing has been found on the north side of the monument. 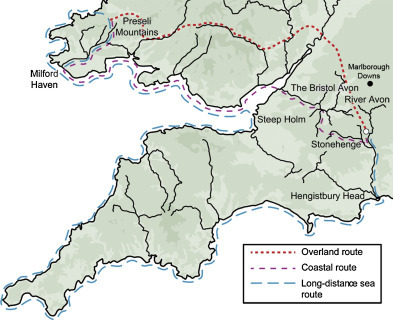 Numerous locations have been proposed for the origin of these sarsens, from the immediate locality to more distant areas of east Somerset and north Wiltshire about 30. km (18 miles) away, but geological provenancing of Stonehenge's silcrete monoliths has so far been largely unsuccessful. 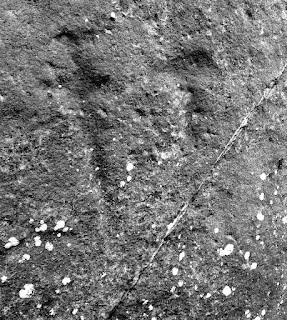 The suspected sources are, however, much closer than those of Stonehenge's 'bluestones', over 200. km (125 miles) away in west Wales. 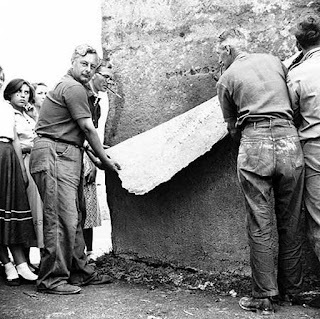 That said, the sarsens are much heavier than the 1-2. tonne bluestones. 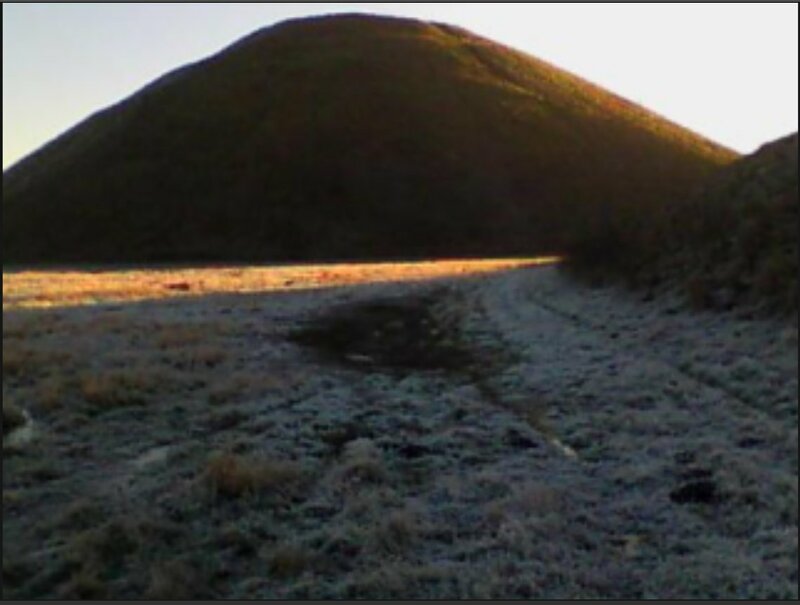 For more than 300 years, researchers have suspected that the main sources of Stonehenge's sarsens were deposits of silcrete on the highest points of the Marlborough Downs, 30. km (18 miles) north of Stonehenge. 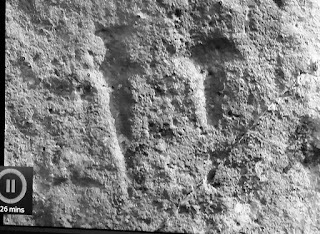 Antiquarian records of a group of sarsens at Clatford Bottom, at the foot of the Downs, suggest that these may have been abandoned in transit to Stonehenge. 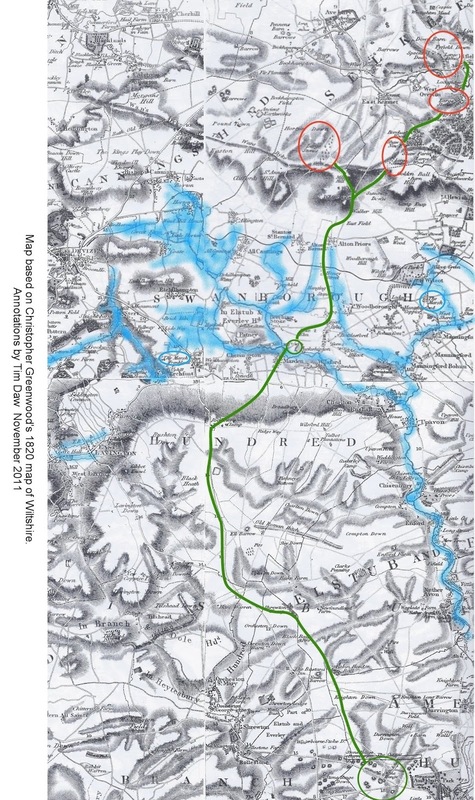 I haven't seen the full article yet but I'm pleased to see the similarity to mine and other's proposed route which I published in 2011, which is generously acknowledged as a source in the paper. 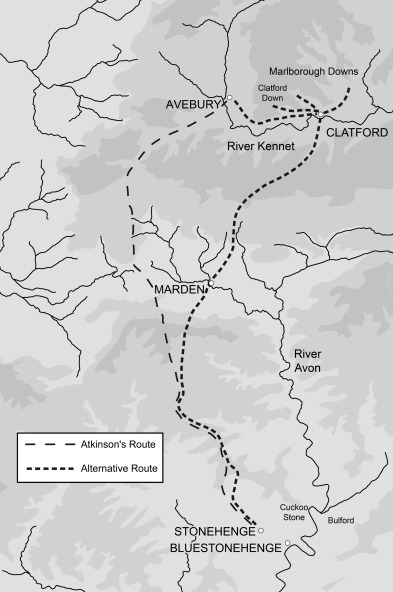 I am not quite sure why the overland bluestone route he shows follows the Atkinson route when it reaches Wiltshire. 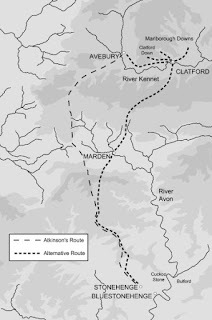 I'm very pleased to see it follow my favoured A40 route but when it gets to Gloucester the obvious route is to follow the route that is now the road to Marlborough and then the "sarsen route" to Stonehenge. 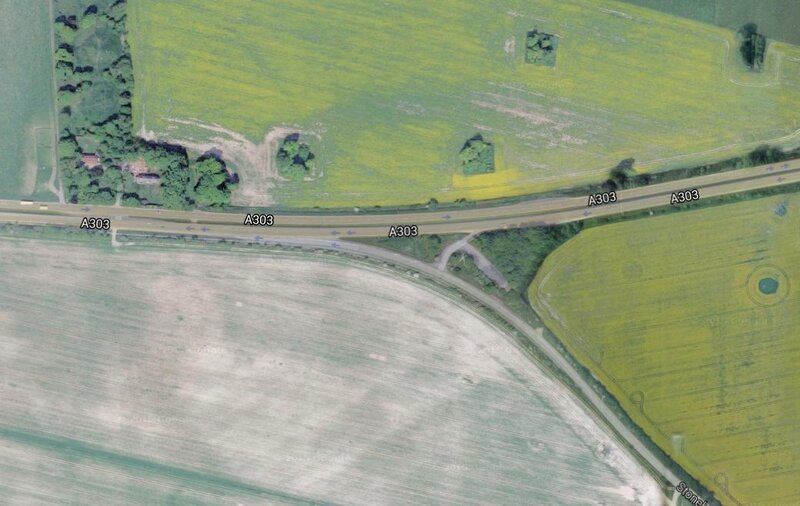 Though there is the scarp at Birdlip to consider so maybe follow the A40 to Cheltenham and then loop round? It would be worth a map based exercise and visit to consider the options. And here is a picture of Mike and I herding cattle across the Kennet at Clatford when he was excavating near by. 1) Got to https://www.lidarfinder.com/ - fantastic, job done. 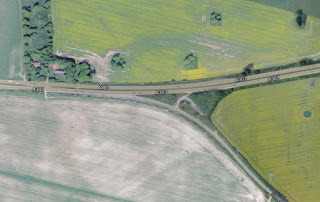 Ever since the Environment made their LIDAR data for most of England free to use I have been meaning to find a simple way to view it that didn't involve map geekery. So here is my simple guide so I remember how to do it again, and it might interest you as well. 2) Click on LIDAR Composite DTM - 2m or one of the other LIDAR data sets (doesn't matter much which at this point). 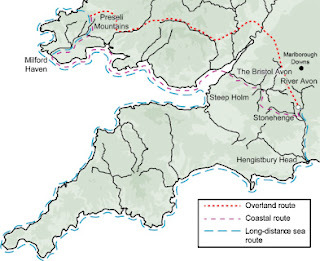 You will then have a map of the UK and a long list of possible active layers on the left. 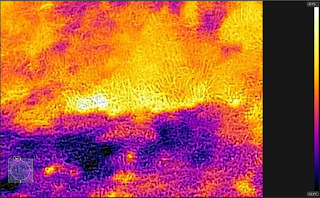 Scroll down and choose the LIDAR layer you want and zoom in on the map to the area you want. 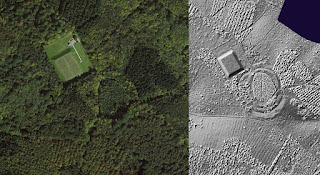 Not all of England is covered and there are different levels of detail - and it is available as a Digital Surface Model produced from the signal returned to the LIDAR (which includes heights of objects, such as vehicles, buildings and vegetation, as well as the terrain surface) or as a Digital Terrain Model produced by removing objects from the Digital Surface Model. 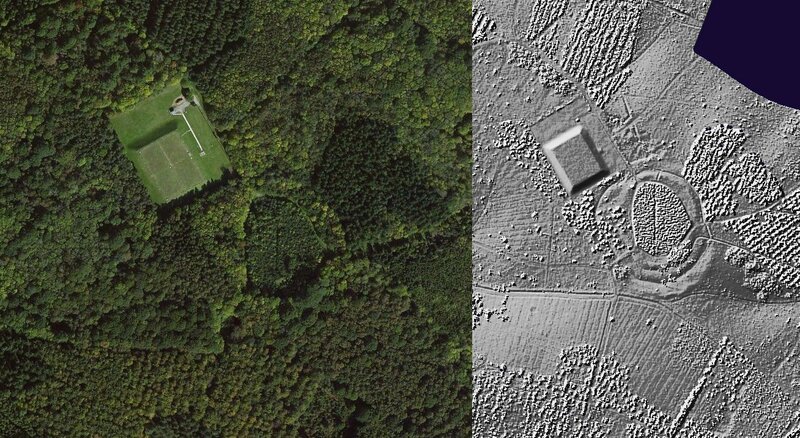 Here as an example is Bladon Camp - heavily overgrown so aerial Bing Map shot doesn't really show it but LIDAR does - https://historicengland.org.uk/listing/the-list/list-entry/1013234 for details of it. 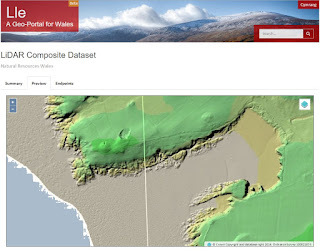 A commentator, Sem, on http://www.megalithic.co.uk/modules.php?op=modload&name=Forum&file=viewtopic&topic=6761&forum=2&start=0 points out that there is some Welsh data available as well. 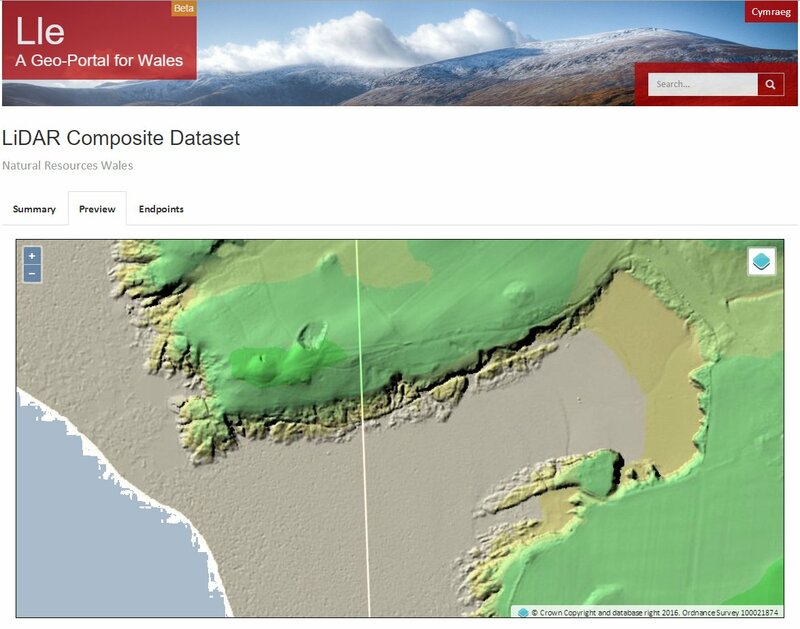 To use on-line click on 'LiDAR Data Now Available' followed by the link to 'lle download portal" and finally on 'Preview'. Navigate the map as per Google and use the 'blue thingy' in the top right of the map to choose your base map and detail.